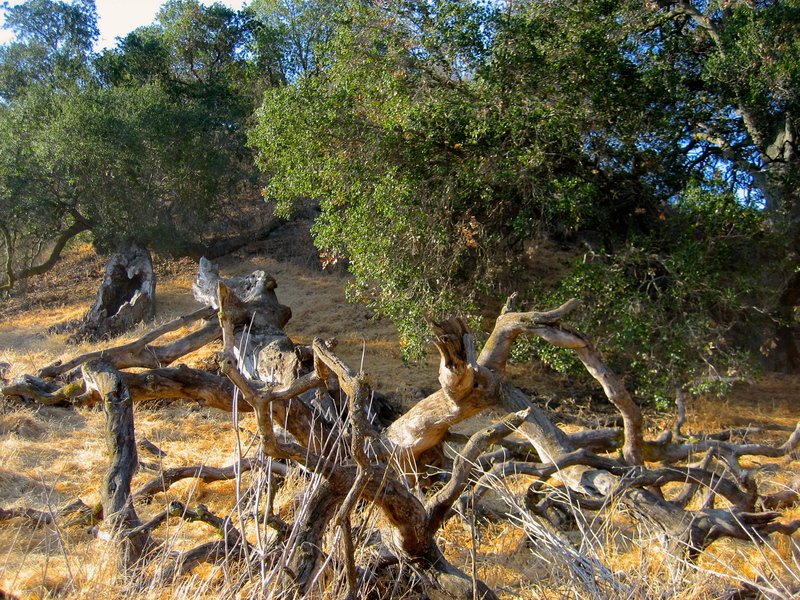 We, the dried grasses are part of the rugged California oak landscape. We are underfoot, undulating with the rise and fall of the countryside. We are entwined with the fallen branches and the trunks of trees; we surround the ends of trees and the beginnings of trees. We provide the soft protective carpet for hikers’ feet and the roof for a hidden undersurface world teaming with life and activity. Roots, insects, burrowing animals, complex processes of decay and decomposition and sparks of life all need us to shelter and give structure to their world. And so we wild grasses, dried out and bleached of our green, are the link between the upper world and the lower one. We belong in both worlds, as small as we are. It takes a special weed mind to see the value in our position, and to live in it proudly, without question. Just think, of all the identical and banal steps of a ladder, each one must stay strong for the entire structure to be useful, and to bring climbers to the next level. There is no room for discontent, no need for longing to be something different. We weeds are the bridges that join nature with the city, the might fallen oak with the grassland, the damp earth with the life that will spring into the sunlight. We are strong no matter our size. We are part of the puzzle of the universe, we are part of all on planet Terra. We are weeds!